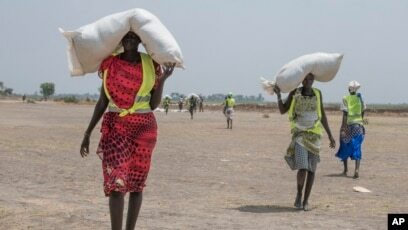 Women walk back to their homes after receiving food distributed by ICRC at a site in Leer County region of South Sudan, Tuesday, April 11, 2017. NAIROBI, KENYA — The food situation in South Sudan is worsening, according to anew report released by United Nations, humanitarian agencies, and the government. It projects the number of people who are severely food insecure is likely to drop to 4.8 million for the last quarter of 2017, down from six million in June. But as South Sudan begins its harvest season, the report notes that compared to last year 1.4 million more people do not know where their next meal is coming from. And, in the beginning of 2018, the report estimates that 5.1 million people are expected to face life-threatening food shortages. According to the report, there is currently no famine in South Sudan, after it had been declared in two counties of Unity State in February. Smerdon said it was beaten back by a “massive and sustained” humanitarian response by aid agencies and donors, and improved access. But, he warned, the risk is increasing. “But the fact that people are now facing extreme food insecurity, i.e. do not know where their next meal is coming from, in different parts of the country, from then, demonstrates how there are limitations to what humanitarian assistance can do, in the face of growing and prolonged conflict. So basically, we cannot do very much,” said Smerdon. Smerdon added that the number of people who are on the brink of famine has almost doubled compared to last year. And, the report states, acute malnutrition has worsened compared to the same period last year. “Continued conflict, humanitarian access constraints, climatic shocks, and macroeconomic instability leading up to the 2018 lean season will likely result in” famine conditions in multiple locations across South Sudan, according to the report. Can Africa’s biggest economy swap its addiction to oil for the starchy tubers that millions line their bellies with each day?